Most people wouldn’t take a six-week Australian vacation during a major home renovation. But then again, most people aren’t as confident about the roles of architects and contractors as Leo Butzel and Robbie Reaber, a retired Seattle couple who have updated their 1950s waterfront home four times since 1989. Ms. Reaber and Mr. Butzel had already redone their blue-tiled bathroom with modern green slate surfaces and remodeled their kitchen and dining area by the time they tackled the master bedroom in 1995. But while they’d worked directly with contractors on the bathroom and kitchen projects, they knew that their ambitious plans to reverse the master bedroom and bathroom — flipping the adjoining rooms around to different sides of the house, and moving walls, electrical outlets, and plumbing — would require hiring an architect. “The contractor wanted the architect’s drawings because it was a major job,” says Ms. Reaber. Because reversing the two rooms would require changes to the house’s plumbing structure, as well as new walls and electrical outlets, Ms. Reaber says the architect and contractor communicated closely during different phases of the project. After hearing the couple’s idea about switching the rooms, the architect generated drawings and remained in contact with contractors. “The majority of the architect’s work was done, maybe two-thirds done, before the contractors began,” she says. “We had total faith in the contractor and architect.” She and Mr. Butzel were able to relax abroad while plaster flew back home. This year, Americans will spend $175 billion on face-lifting — in some cases, fork-lifting — their homes, according to the National Association of the Remodeling Industry (NARI) in Des Plaines, Ill. The figure represents a 20% growth in remodeling spending since 1999. Yet, despite that growth, consumer’s confidence about how to work with architects and contractors hasn’t necessarily increased. Ms. Reaber’s and Mr. Butzel’s confidence are the exception rather than the rule. “People no longer feel they have to live in a home as it is when they bought it,” says Gwen Biasi, NARI’s director of marketing communications. “Homes have become many people’s hobby.” But whether that hobby calls for knocking down walls and reconfiguring floor plans, or simply updating lighting fixtures, flooring, and countertops, hiring outside help to do the work can confuse homeowners. 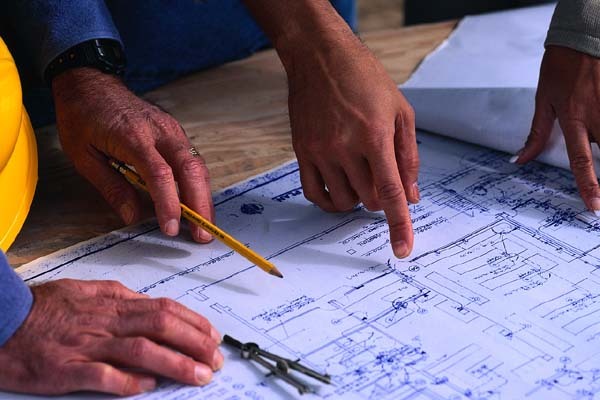 Architects are necessary whenever a home remodeling calls for changing a home’s “footprint” (making an addition, or altering room sizes and shapes) or making major changes to plumbing, electrical, or heating systems. Architects will explore a homeowner’s lifestyle and use of the house, assess the house’s structure, and draw up construction plans that address both the owner’s desires and the structure’s requirements. Depending on their city’s codes, homeowners may also need to submit plans with an architect’s seal before beginning work. On the work side, contractors actually execute architects’ design plans, rolling up their sleeves and doing the installation and building. Many remodelers can hire contractors directly without using an architect. This is especially true when the project involves replacing appliances, surfaces, cabinetry, or other built-in furnishings or making additions within a single room (a loft for children, an extra closet) but not breaking down existing walls. Homeowners who work with an architect ultimately have to hire contractors (directly, or through the architect) to do the work, while those who go straight to contractors often learn that contractors want the advice of an architect before proceeding with changes. It’s possible to hire a general contractor to oversee a multistep project that subcontractors can address — pulling out all of a room’s cabinetry and appliances, rewiring the room, then installing new cabinets and appliances, for instance. Of course Mr. Brick would think so: He operates a so-called design-build firm, which employs both architects and designers under one roof and handles projects that cost $75,000 and higher. Design-build firms account for 20% of NARI’s 6,000 members, and their numbers have grown slightly in recent years. These companies attempt to blend the best of architecture and general-contracting businesses under one roof. Mr. Brick says that going to an architect for designs and drawings but hiring general contractors separately can lead to higher costs, since an architect’s design fees may not include the cost of general contractors’ work. An architect alone, he says, can’t control the cost of contractors — meaning a client could get a dream design that is ultimately too expensive to execute. Going directly to a general contractor might be faster, he says, but could still lead back to an architect if subcontractors run into trouble. “Our advantage is we can work within a client’s budget,” he says. “Because we do the full realm of the work, we can make suggestions that make a project workable.” Architectural consulting and drawings account for only 2% of his firm’s typical project costs, he said, with contracting and materials representing the rest. Key Question: Why Are You Remodeling? Some of the confusion about whom to hire, says NARI’s Ms. Biasi, may stem from the different reasons homeowners remodel. Ms. Biasi attributes the remodeling boom to the country’s aging housing stock, much of which was built during construction booms in the 1950s and 1970s. Homeowners often remodel old homes out of structural necessity — a maneuver that often requires an architect’s help. Many also choose to make additions rather than buy a new home. Ms. Biasi says that in 1999, the most recent year data are available, 5.1 million out of 44.4 million remodeling projects involved additions to a home’s original footprint. Prior to their bedroom remodeling, Ms. Reaber and Mr. Butzel enjoyed researching their own home designs and hiring contractors through word-of-mouth — a process aided by Ms. Reaber’s prior job as an accountant at an architecture firm. At one point, the couple even fired a kitchen designer and replaced her ideas with computer-aided-design software renderings. For some projects, architects and contractors say, acting as your own general contractor can be a manageable process. Elaine Chen, a 34-year-old advertising executive in New York, took this approach. Ms. Chen, who budgeted $25,000 to renovate the 900-square-foot Manhattan condo she bought last year, took blueprints from her 1970s space and made her own decisions about what she calls a top-to-bottom remodel of its kitchen and dining area. She already has located contractors through friends. Among them: the doorman who outbid rivals for a job sanding her floors. Ms. Chen says she wasn’t sure if he’s licensed as a contractor, but her condo association includes him on an approved list of repair and remodeling vendors. So given the board approval and his bid, she felt confident. Ms. Chen’s approach irks architects like Bryan Welty, of Welty & Associates, Dallas, who believes architects can help with more than just major home remodels. Mr. Welty is so concerned by the perceptions that architects produce only artsy and expensive designs for big-ticket remodels that he’s launched a Web business called virtualarchitect.com to market architects’ services for a broad array of remodeling projects. However, he says, consulting an architect isn’t always expensive. For instance, his firm worked with a family that wanted to build a wall replacing an entry between a kitchen and dining room. They got a $200 estimate from a contractor willing to build a plain wall between the rooms. Then they approached Mr. Welty, whose firm designed a dividing wall with built-in benches on either side, a plan that made creative use of space and cost $400 — a price that included the $200 contractor fee. The family used the architect’s plan. That was the case with Mr. Butzel and Ms. Reaber’s builders, who wanted advice on their 1995 bedroom remodeling. These days, Ms. Reaber says, she and her husband are “done” with making changes to their 1950s home. She likes to show guests the effects of the remodeling they’ve completed over the years, including the way the master bathroom and its whirlpool tub offer a view of the water and access to a deck that was once steps from the bed.